Ruud and Jacqueline Persoon, the founders of Terra Personas came from Holland in 2006. The purchased old vines in the south-east of the DO Montsant wine region. 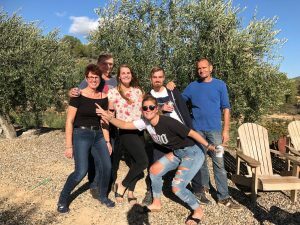 Genuinely seduced by the charm of this ancient Catalan wine region, Ruud began by planting new varieties to extract the most from the environment. He recuperated the olive trees that are spread out around the vineyards and started producing premium virgin olive oil. Under Ruud’s nourishing attention, climate and earth take care of the natural equilibrium. The little Persoons. Kim, Max, Lisanne and Roy are the new generation Persoons that grow up between the mediterranean vine and olive trees in the Priorat and the North Sea region with the bulbfields. They learn how to respect nature and build up a unique experience for the future of Terra Personas.